We provide instant and easy to read Car History Report with PPSR Certificate using government sources. Get the type of report that the financial institutions use. Enter the VIN, Rego Number, or Number plate to get the official Australian government REVS, NEVDIS, and PPSR data on any vehicle across Australia. Results sent instantly to your phone and email. No registration required. What's in Your REVs Check Report? The REVs Check Report comes with detailed information on the vehicle, laid out in an easy-to-read format so you can quickly scan the details you need. The report includes all the following facts so you can decide if that vechicle is right for you. What is Takata airbag recall? Cheap and quick. Why waste time and emotional investment in looking at a car that is going to cause headaches down the track, it weeded out a couple for me in my recent search. Quick, fast and painless experience. Would go to them again! Why Choose Quick Revs Report? Carrying out your Quick Reports with us is Affordable, Secure and Fast. Quick Revs Offers the Cheapest REVS Check Online, Allowing You to Save Money in the Process. We Produce a Fully Readable Report, Made for People Who Are Not Familiar with the Industry. We Use an SMS Feature to Deliver the Report Summary Directly to Your mobile phone, this Being Included in the Base Price. Completely Secure and Fast, Using Only but Official Data and Delivering It in No Time. Also known asencumbrance, at this point you will be allowed to know if there is any existent loan that could affect the vehicle in the future. If positive, you can always negotiate a payoff agreementwith the seller. You will be able to know if the car is already registered and the expiration time. Also known as rego detail, also shows the state where the car is registered. As one of the main indicators included in the report, the stolen check makes clear if the used car in question is tagged as "unrecovered theft". This is especially important to avoid legal issues. Let's not forget the specifications of the car you want to buy. Our Car History Report delivers complete details about the vehicle's specifications. Do you know what is Revs Check & How It Works in Australia? REVS Check was initially a state-based search of the Register of Encumbered Vehicles (REVs) or the Vehicle Security Register (VSR). The details contained in a Revs Check are required to be submitted by law and easily accessible to all Australians online based on the state in which the vehicle was registered. What is Revs Check Today? When you search online for Revs Check today, you may also come across the Personal Property Securities Register (PPSR). That’s because the all information that was stored on the Revs databases in each state was transferred to the PPSR. The PPSR is now a nationally accessible database. It carries all the information previously found in a Revs check and additional information such as finance owing on a vehicle. How does Revs Check Work in Australia? In looking at how it works, you need to also know about the various agencies involved. They either manage the service or provide the necessary information you require to use the service. The PPSR (formerly Revs Check) is managed by the Australian Financial Security Authority (AFSA). The AFSA an executive agency of the Australian government. They launched the PPSR in 2009 and has since been responsible for administering the system, keeping the content current, and maintaining the database in a format that businesses and individuals can use. Where does the PPSR (formerly REVS) get its information? There are essentially two types of information that you can retrieve through a PPSR search online. The first is information that is registered directly with the PPSR – secured interest in a personal property. This means that all vehicles (and other recognized personal properties) that have finance owing on it should be registered with the PPSR so potential buyers or creditors can see the details of the amount owing. The other set of data that the PPSR also carries is the data we are used to from a Revs Check. This includes vehicle registration details, written-off status, stolen vehicle status. These details are data found in the National Exchange of Vehicle and Driver Information System(NEVDIS). You can learn more about NEVDIS and the information it provides. How can you access the information? As an individual, you can access the information in the PPSR by running an online search at the QuickRevs Revs Check service. All you need is the vehicle VIN to run a Revs Check by VIN number, or the registration number to search the database and get the information you need. With QuickRevs, our information comes in an easy-to-read report that outlines the details retrieved. Your results will also come with an official government PPSR certificate. This is a legal document that confirms your search and the results available on the day and at the time that you searched. Finding out that the vehicle you just spent a lot of money to buy is a write-off can be a financially – and emotionally – devastating situation. Here’s how to prevent this from happening to you. A vehicle write-off means that the vehicle was so severely damaged that it’s not safe or economical to undertake any repairs. The registration will be cancelled, and the car write-off details recorded on the Written-off Vehicle Register (WOVR). There are essentially two types of write-offs in Australia – statutory write-offs and repairable write-offs. No matter the type of write-off, they will be recorded on the WOVR. Vehicles listed as statutory write-offs are required by law to never be repaired because of the severity of the damage. They are deemed too structurally damaged to be safely used on the roads and may only be used for spare parts or scrapping. A repairable write-off means that the vehicle can be repaired and re-registered for road use provided that it was done according to required standards. When this is done, the vehicle is then registered as an Inspected Write-Off. This means that the repairs were done, inspected by a government inspector, and deemed fit for road use after passing a roadworthiness check. You should check your local state regulations – such as the write-off status details outlined here for Victoria - on the use of written-off vehicles. Queensland also explains how the WOVR can limit the use of stolen vehicles in repairing write-offs. There are unscrupulous individuals out there who attempt to pass of repaired vehicles as regular used cars. Sellers are required to advise you if repairs were done, but of course, there will be some that won’t tell you this truth. Knowing whether a vehicle was damaged enough to be registered on the WOVR is essential to prevent buying a lemon that can cause you thousands of dollars in repairs. It also protects you from losing out on the other end of the sale when you’re ready to upgrade. The value that you think you can get for the car will be severely cut if the potential buyer run a Revs Check and realises that the car was damaged. That’s why you should protect yourself now and run a car history check online. Each Revs Check report by QuickRevs details any data placed on the WOVR so you can make an informed decision about the vehicle you want to buy. Should you buy a repaired write-off? So, if you want to ensure that you know if the vehicle had repairable damages or was listed as a statutory write-off, then run a Revs Check online and get the write-off status details. What to do if you want to buy a car with finance owing? When buying a car from a private seller, there is the potential for buying an encumbered car. According to Australian laws, the buyer is solely responsible for determining if the vehicle is free from any secured interests. That’s because they’ve put in place measures that you can easily check to verify these details. If you choose to forego checking, then you have no recourse if a financial institution tries to recover their lost revenues because the owner defaulted on the loan. Therefore, whether or not you know about the encumbrance at the time of the sale does not protect you from the implications of having bought the vehicle. So, how can you protect yourself? Just as you can check the car’s write-off status and any damages and mechanical issues, you can also check if there’s finance owing on the vehicle. Financial institutions are required to register any secured interests in personal property with the Australian Personal Property Securities Register (PPSR). This means that once they have a loan on a vehicle, they should record the details of the loan with the PPSR. This allows persons to search the register and get the necessary details about whether there is finance owing before going through with buying the car. Buying a vehicle with finance owing does come with some risks for you, including those we outline in this post on encumbered vehicles. If you buy a vehicle that has finance owing and the previous owner fails to complete payment of the loan, your vehicle is still considered the collateral for the loan if it has been registered with the PPSR. When you run a PPSR Search and it returns a PPSR certificate, this is your legal record of the date and time of the search to protect you if a situation arises after the sale. The PPSR search results will outline the details of the encumbrance as well as other relevant car history information you should consider. What to do before buying the vehicle? There are a few things you can do when buying an encumbered vehicle. As close as possible to the date of the sale, ensure that you get an official PPSR search certificate. If it doesn’t show any finance owing, make sure to keep this document as your record that at the time of the sale there was no interest registered on the PPSR by any financial institution. This could protect you as an innocent buyer. If the PPSR certificate shows encumbrance and the seller confirms that they will repay the loan with your payment, then the best thing to do is do the transaction at the financial institution. With this, all persons involved in the sale can witness the repayment of the loan and the simultaneous transfer of ownership of the vehicle to you. So, protect your investment the best way possible. Get a PPSR search to make sure there is no finance owing on a vehicle before you make a costly mistake. Is a Rego Check the Same as Revs Check? The short answer is no, they are not the same. First of all, one can be found for free across various states but offers limited information. The other provides a detailed car history report that not only includes the vehicle registration details but will also carry other data necessary when trying to decide on a car to buy. What is a Rego Check? A Rego check is a check of the status of the vehicle licence (rego) using the licence plate number of the vehicle. This is often a free service offered in many of the states such as here at the Western Australian road transport website or the Queensland transport and motoring site. You will need to know the vehicle registration plate number as well as the state in which it is registered in as specified by the NSW free vehicle registration check. How is it different from Revs Check? 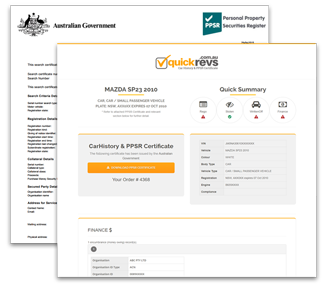 With a Revs Check by QuickRevs, you won’t need to do an additional rego check online. All the details that would be provided in the rego check will now be in the revs check report along with the necessary information that can help you make an informed decision when buying a used car. Check more details on rego check and why you may not see any results when you run a rego check. Stolen Vehicle Check – Why you need to know and how to check the vehicle’s stolen status. Do you know that the statistics for stolen vehicles in Australia is one in every 10 minutes? According to Budget Direct, NSW, QLD, WA are amongst the top four states for stolen vehicles, only surpassed by Victoria. Now, with only 1 in 5 stolen vehicles recovered, where do you think the other 4 of 5 cars are going? Apart from some that are scrapped for parts, the rest are sold to unsuspecting Australians thinking they are getting a bargain or a good deal on a used car. This is just one of the reasons that buying a used car in Australian can be such a daunting prospect for buyers. Apart from knowing whether the vehicle was damaged and repaired, you now also need to worry about whether you are buying stolen property. A Revs Check is essential to protect used car buyers from being a victim of rebirthing. Rebirthing is a dubious practice where persons take the registration number for a vehicle registered in the WOVR and use it to sell a stolen car. This, in essence, gives new life to stolen property. With a PPSR Search/RTA Revs Check, you can verify the car registration, VIN, write-off, and stolen status details before you ever put any money down. If the details aren’t matching what the seller provides, then you know you need to double-check or forget the sale altogether. There are other reasons why you need a Revs Check, and we’ve outlined most of them here in an article looking at Revs Check in Western Australia, one of the areas well known for car thefts. As you can see, it is essential that you conduct a Revs Check. And, if you believe that you are being sold a stolen vehicle, then contact your local police force in NSW, WA, QLD or any other state you’re in. We recommend that all used car buyers get a QuickRevs car history check before buying a used car. The report will only cost you about $6 or $9 depending on the type of search you run – one of the most cost-effective options on the market. Spending less than $10 could save you thousands of dollars of your hard-earned money, or worse yet, that of a financial institution that you will still need to repay even if you later lose the car because it was stolen. So, don’t become a statistic. Don’t be one of those buyers saying they should have or could have done things differently when it’s now too late. Instead, you can make the necessary steps to protect your investment and prevent purchasing a stolen vehicle with a Revs Car Check. Risk of Buying an Encumbered Vehicle. How to buy a risk free used car? Finding a used car dealer in Australia?